Trying to kick your pricey Starbucks habit but not willing to give up your daily coffee fix? Over the holidays, I watched my aunt, Synara, make her own easy, cheap “lattes” – without an espresso maker or a fancy, expensive cappucino machine. Her secret weapon is just a simple, $12 tool: a frother! I tracked down a Bodum Schiuma frother at Target on sale for $6 but even at full price, you can make hundreds of drinks for less that what you’d pay for a few stops at your favorite coffee shop and they taste just as good. Now I know the purists out there will say this isn’t really a latte because by true coffee standards, it isn’t. However, it’s still a great way to satisfy your cravings without breaking the bank! Make coffee using your standard coffee maker, only double the ratio of coffee beans to water to make the coffee extra strong. Pour milk into a large, microwave-safe coffee mug. Add creamer or honey, if you are using it. Microwave milk for 1 minute and 30 seconds. 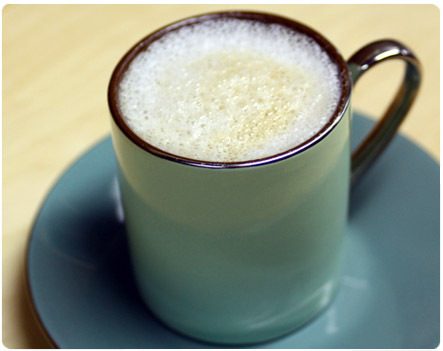 Stick frother into milk and froth until milk is foamy. Microwave for another 30 seconds. Pour brewed coffee into mug by tilting the mug slightly and pouring coffee along the inside of the glass, as you would a beer. This allows you to avoid ruining your foam. Simply clean off your frother with a little soap and water and enjoy! That’s what those weird wire things are for! Love the coffee mug! Beautiful coloring. Where did you get it? I received the coffee mugs as a Christmas gift so I’m not sure exactly where they were purchased. It’s the “Birch” style from Yedi Houseware, which you can find at Macys or Bed, Bath & Beyond. Aren’t they cute?